My mather-in-law went to Croatia. She bought chocolate and salt. This salt is mild. It is very nice. My older son is good at swimming. He learned a survival swimming in his swimming school. He tried it the sea. When he floated, he was wearing his cloths. And he had a empty plastic bottle. If he get on Titanic, he can survive. He scooped air his shirt. By the way, today is my birthday. But it is hot today too. Actually I don't feel happy. It might be a turning point of my life. So my life that lived longer than my future. Do you understand my feeling and English? 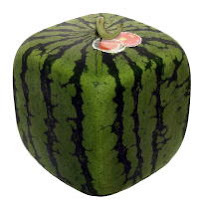 When I went to a supermarket, I found a square-shaped watermelon. I thought it was strange. When I was young, my mother bought big watermelons in a visitable shop with me. And she carried them which were in net every time. And I had ate watermelons before the end in summer. So I fed up with watermelons. By the way, when you eat watermelons, do you spit seeds of watermelons? They said if you eat a lot of seeds, you might suffer from appendicitis . That is not true. It is just an urban legend in Japan. But my husband believe it. I'm sorry I can't visit your blogs. Because it is very hot in Japan. I want to give up learning English. Now I just sitting front of my Personal Computer which is heat. I sweat easily. Japanese schools have health checkup every year for kids. They take dentistry, ophthalmology, internal medicine, otolaryngology checkup. Off course there are body heigh and weight. My older son was a bad inspection result of Eyesight check. Yesterday, my older son contacted an eye doctor with us. And my older son checked his eyesight again. So my older son couldn’t read some hiragana.